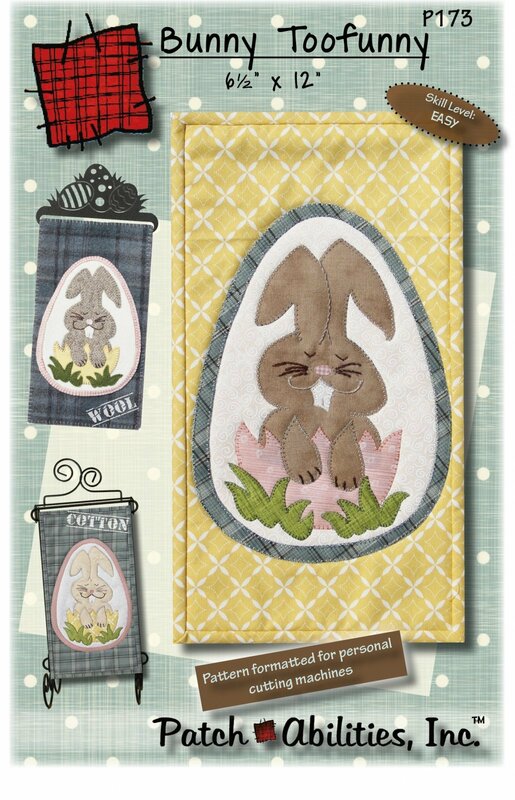 P173 Bunny Toofunny is a pattern for creating an applique quilted wall hanging for Easter. This beginner friendly pattern includes lovely basic instructions to ease beginner jitters. Finished size is 6.5 x 12". Display on the wall with 6" hanger or a 6 x 12" Table Stand on a shelf or small table.� Pattern includes embroidery stitch guides, beginner tips and binding instructions. Just a little bit of embroidery and this can be completed in just 1 day. Pattern includes embroidery stitch cover shows both a cotton and wool sample, making him irresistable to everyone regardless of their preference to wool or cotton.� Purchase options include buying this pattern with a 27532 - 6" Easter Eggs split bottom hanger included, pattern with complete wool kit including background wool, or pattern with 6" Easter Eggs Ackfeld Wire hanger AND complete wool kit.